According to data collected by the National Institute of Child Health and Human Development, about 30% of all children studying in middle and high school were at least once in a semester bullied, or acted as bullies themselves in the U.S. (National Conference of State Legislations). 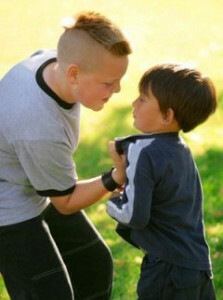 The methods of bullying may differ depending on a social and gender group (thus, boys usually choose more direct forms, such as physical abuse, whereas girls prefer to spread gossip and act in other non-violent ways), but they all have at least one common effect: increasing the social isolation of a victim. At the same time, when asked about the reasons standing behind their inappropriate attitude towards victims, bullies have little or no reasonable explanations. At the same time, psychologists have distinguished several psychological traits that are shared by the majority of bullies, regardless of the country they reside in. Bullies most often possess either a manipulative and reserved, or an expressive and active type of personality; they are concerned about their own interests, finding it difficult to see circumstances from the perspective of other people surrounding them; they manifest a desire to gain power over others, and use force, abuse, or manipulation to get what they want from others (Sacramento County Sheriff). At the same time, bullies are considered to feel psychological pain within themselves, probably caused by the shortcomings of their own lives. However, the latter does not excuse the damage dealt to victims. According to recent research, regular headaches, stomachaches, panic attacks and periods of increased anxiety, eating and sleeping disorders, and most disturbing, depression, are among the typical health issues that bullied students experience. However, surprisingly, students who act in an abusive and insulting manner are exposed to these symptoms as well (Huffington Post). In addition, these symptoms usually manifest in clusters: one symptom is often accompanied by several others, which gives psychologists preconditions to refer to these symptoms as a sort of medical syndrome, caused by (or connected to) bullying. Parents who suspect their children have become victims of school bullying are usually recommended to pay closer attention to them. They should encourage children to talk about school life and listen to them carefully; treat children’s complaints seriously, as they may hide much more serious problems; monitor children’s physical (bruises, torn clothes) and psychological (apathy, sadness) conditions. Caring parents should contact school organizations when they suspect their children have been bullied to ensure they are better protected at school. At the same time, it is useful to teach children some self-protection skills, simultaneously ensuring them in the superiority of the peaceful way of resolving conflicts, and in the high value of kindness and an appropriate attitude (Sacramento County Sheriff). Bullying is a serious problem in schools around the entire world. In the United States alone, about 30% of middle and high school students confessed to being bullied or acting like bullies themselves. Bullying can cause serious psychological and physical problems both in the victim and in the aggressor; some scientists believe these problems can be referred to as a specific syndrome. At the same time, parents can play a significant role in protecting and securing their children from bullying. “Bullies: A Serious Problem for Kids.” Sacramento County Sheriff. N.p., n.d. Web. 13 Nov. 2013. <http://www.sacsheriff.com/crime_prevention/documents/school_safety_06.cfm>. “School Bullying Overview.” National Conference of State Legislatures. N.p., n.d. Web. 13 Nov. 2013. <http://www.ncsl.org/research/education/school-bullying-overview.aspx>. Velez, Mandy. “Bullying Increasingly Seen as a Public Health Issue.” The Huffington Post. TheHuffingtonPost.com, 08 Nov. 2013. Web. 13 Nov. 2013. <http://www.huffingtonpost.com/2013/11/08/bullying-public-health-issue_n_4241468.html>.